Thick, frosty rime coats the ancient stonework in a dank, unlit vault buried deep below the floor of the cold Moonsea. The chill air chokes the lungs and carries the stench of death, fetid and heavy, despite the bone-chilling cold. Two brooding archways lead from the vault. One leads to a labyrinth of passages, chambers, and stairs, all as dark, foul, and icy as the vault. The other opens onto a tiny chamber, little more than an alcove, whose walls bear an intricate tracery of arcane symbols and obscure runes. One who enters here can travel many leagues north, east, or west with but a single step. 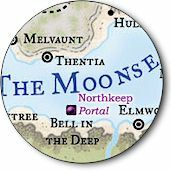 In ages past, the chamber rang with the measured tread of soldiers walking their rounds, but the solders have gone to join the faceless, nameless legions of folk who have succumbed to the unrelenting dangers of the Moonsea region, along with the cities where they once dwelled. Today, the vault is in the domain of the lich Akempus, a brooding, foul-hearted traitor who loathes most everything that lives and breathes. A native of the D&D game's "hometown," Lake Geneva, Wisconsin, Skip Williams truly "grew up" with roleplaying gaming. His first introduction to the D&D game came through high school chums, and the novelty of the new genre piqued his interest. A participant in several of the local campaigns, Skip contributed much to the early growth of the game. Now a freelance game designer, Skip has authored many popular game books and accessories, and he is coauthor of the new D&D game and the Forgotten Realms Campaign Setting book.